An aggressive philosophy professor would like to talk you out of your faith! Dr. Craig is all ears! Kevin Harris: Welcome to Reasonable Faith with Dr. William Lane Craig. Wait a minute! You mean faith can be reasonable? Really?! You mean faith isn’t believing what you know ain’t so? I think we need to look once again for the millionth time at some definitions. I’m Kevin Harris. 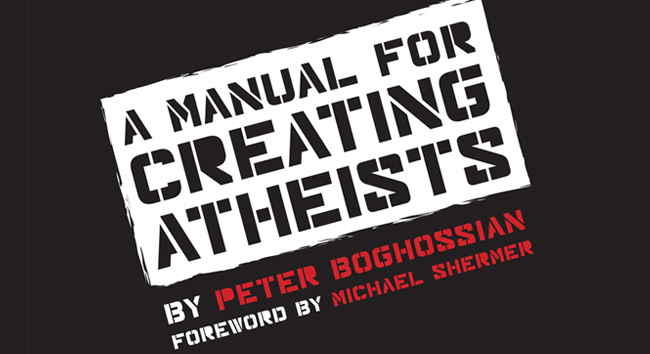 We’ve gotten some emails about this new book called A Manual for Creating Atheists by Dr. Peter Boghossian, Philosophy Instructor at Portland State University. He calls himself a street epistemologist. Dr. Boghossian seems to be concerned that there are multitudes of manuals and materials on how to present the truth of Jesus with your friends, family, and neighbors, but no such material exists for talking people out of their faith. So he’s written a manual. It’s got the endorsement of Richard Dawkins and some others, and lots of talk on the blogosphere, and a good dose of Christian response as well. Tom Gilson, who blogs as The Thinking Christian, has written a lengthy reply to this manual. Dr. Craig, it seems right off the bat that Peter Boghossian encourages a sort of evangelism for atheism or unbelief. Dr. Craig: It’s interesting that this is a philosopher who also wants to be an activist. Kevin Harris: Very much so. Dr. Craig: Very much engaged in the so-called culture wars. Kevin Harris: Let’s listen to some clips here. I think we’ll pick up that this all comes down to an accurate definition of faith. Let’s see if that emerges. Dr. Boghossian: Faith is not a virtue. It is absolutely not a virtue. It is an unreliable epistemology and part of the problem is that people think that holding a belief tenaciously, being a person of faith, makes you a good person. Being a person of faith does not make you a good person. It just means that you have a process of thinking about the world that is less likely to lead you to the truth. Once we make that shift from faith as a morality to faith as an epistemology, I think the house of cards will crumble and everything that is built upon the house – religion, everything – will fall with it. Dr. Craig: This is so fundamental. This is a watershed. He says that faith is an unreliable epistemology. He wants to make faith an epistemological category instead of a moral virtue. It is right there that we need to dig in our heels and say this is a misunderstanding of faith. Faith is not an epistemological category. It is not a way of knowing something. Faith is a way of trusting something. Faith is trusting in that which you have reason to believe is true. So it is once you have come to believe that something is true using reliable epistemological means that you can then place your faith or trust in that thing. To do so is a virtue. It is a virtue to have faith in God. For example, to trust in him. So Boghossian is wrong right out of the blocks here and what will happen now is the trajectories will increasingly diverge as we go on. So you’ve got to stop it right out of the blocks, at the beginning, and say, “No, you are incorrect. You are construing faith as an epistemological category.” It is not that. Faith is one of the many different virtues. Dr. Boghossian: My book is about how to talk people out of a faith tradition, out of irrationality, out of superstition, and into reason. Philosophy – the term is epistemology – how you know, how you come to know. So the book teaches people to talk other people into a reliable epistemology. God is a conclusion that one comes to if one doesn’t have a reliable epistemology. Kevin Harris: That is a bold statement. Dr. Craig: Right, God is a conclusion you come to if you don’t have a reliable epistemology. He says it will be reason and evidence that will guide you toward truth. Of course our claim, Kevin, is that there is such a thing as reasonable faith. That is to say, following the guide of reason and evidence, one can come rationally to the conclusion that God exists. Then it is rational to place your trust in that person whom you have come to believe in on the basis of reason and evidence. So you can see immediately that by construing faith as an epistemological category which is in competition with reason and evidence that Boghossian is going to wind up with skepticism about God’s existence. Kevin Harris: He doesn’t seem to understand that this is a huge straw man and he is expelling an incredible energy to burn this straw man. Dr. Craig: I know. And this is a philosopher. He ought to be familiar with the work of people like William Alston and Alvin Plantinga, Robert Adams and others. Why this caricature or this attacking, as you say, of straw men – this sort of lowest representation of belief in God rather than criticizing it as it is expressed in its most sophisticated representatives? Kevin Harris: If we are going to have a war over a definition, how are we going to get that definition? You quoted many sources that you lay out in Reasonable Faith, anchored in Scripture, anchored in the annals of philosophy and the literature on it, when you put all of that together, you can – what? – come up with a good, solid definition? Dr. Craig: I think so. You can say this is the standard way in which this term is used. Now, of course, revisionists can always choose to redefine the word as they please in an idiosyncratic way. As you know, this is what has happened with the word atheism in our generation. People are redefining the word so that it is no longer the view that God does not exist. It is a psychological state of lacking belief in God. That idiosyncratic definition just flies in the face of the traditional meaning and use of the word. If you are dealing with a person who insists on using his own idiosyncratic definitions then I think one simply has to make clear which words are being used in which way. I remember in one of my debates I said, “All right, if that is what you want to define atheism to be, then what I will be criticizing will be schmatheism. Schmatheism is the view that God does not exist. And the real question then is – is schmatheism true or is theism true?” And you then proceed. So if he doesn’t want to call this faith, we can call it schmaith or something like that and that’s the real issue then. It is not the English word that is assigned to it but it is the concept that we are talking about. Kevin Harris: I just googled the definition of faith. The first thing that comes up is (1) Complete trust or confidence in someone or something, and (2) Strong belief in God or in the doctrines of a religion based on spiritual apprehension rather than proof. Dr. Craig: A little more subjective there. Dr. Craig: And notice that that was “even without” but that doesn’t exclude that you might have evidence for what you trust in and have confidence in. Dr. Boghossian: That’s what I’ve done for twenty five years. I’ve taught critical thinking, I’ve taught in the prisons, I’ve taught in the streets. I’ve engaged people about their beliefs. I’ve published in these areas in the domain of pedagogy and effective interventions. And I’ve literally taught tens of thousands of students. Dr. Craig: I think what this underlines is how strategic university professorships are. This man speaks of the tens of thousands of students that he has taught in his career, and he has attempted to teach them the irrationality of faith and to get them to exit faith. That just underlines for me how important it is that we, as Christians, find a place at our universities, on the faculties, and in these departments where we can be a light for Christ, to counteract this sort of unbelief. Interviewer: So you obviously are trying to convince people to become atheists. What are the benefits to being an atheist? Dr. Boghossian: No, I’m not trying to convince anyone to be an atheist. I’m trying to convince people to lead thoughtful and examined lives. And I’m trying to convince people to have an epistemology of ways that they come to knowledge that they are rooted in reason and evidence. If someone has an epistemology like this, a natural consequence of this is that they will not believe in God. Kevin Harris: The end would be atheism. Dr. Craig: Well, but he said that his interest is not in creating or convincing people to be atheists. The title of the book is A Manual For Creating Atheists. So this is a lot more than teaching people to become critical thinkers. His manual is a manual for creating atheists. Why is he being disingenuous about the purpose of the book? Dr. Boghossian: God is an easy bulls eye on a field. I call it street epistemology. What I want to do is raze the whole field. I want to take out the target and everything. I want to change the way that people come to formulate beliefs. Someone could still believe in God and have a faulty epistemology. Or not believe in God and have a faulty epistemology – a faulty way they come to knowledge. This centers on helping people’s epistemology – helping people having more reliable ways to come to knowledge. Dr. Craig: Now he said there a person can have a faulty epistemology and believe in God or a person can have a faulty epistemology and be an atheist. But will he allow that a person can have a sound epistemology and belief in God? That’s the question. Can you be a critical thinker and believe in God? Or is he really prepared to say that people like Peter van Inwagen, Robert Adams, Alvin Plantinga, and so on and so on, are all irrational? That these men are not critical thinkers? That’s what he is saying, if he thinks that you can’t have a sound epistemology and be a theist. Interviewer: So what is the most commonly misunderstood thing about atheism? Dr. Boghossian: That the atheist is a bad person. That someone who doesn’t have a strong force of conviction about something – anything – is a bad person. That somebody who “You don’t believe in anything? Faith in God? Faith in science?” But I do think that somehow there is a moral problem with atheists because they don’t have tenacity of belief, they don’t have conviction. Faith is bundled with a moral edifice, and if you are a person of faith, you are a good person. That link needs to be terminated. We need to think about faith not as a moral issue but as an epistemological issue. Not as an issue of making you a good person or a bad person, but faith itself is an unreliable way of reasoning. It is a process of reasoning that will not get you to the truth and it will not enable you to discern truth from falsity. Kevin Harris: Bill, he is again reemphasizing that if a person has faith they are seen as a moral person and if they don’t have faith, lack of conviction, they are seen as an immoral person. He certainly has a conviction of his beliefs here. Is there a moral component? Are you seen as being a more moral person the more faith you have? Dr. Craig: I think that faith is a virtue – faith in God I mean to say is a virtue. We all have faith. The way he is describing it is as though some people have no faith. That is not true, obviously. The question would be: what is the object that you are trusting in? What is it that you place your trust in? I would say that to have faith in God is virtuous. That doesn’t mean that that makes you a good person because obviously there are lots of other things that go into being virtuous as well. But the key error that he makes is saying that faith is an unreliable way of reasoning. Faith isn’t a way of reasoning! Therefore, the whole category here is being misconstrued in thinking faith is a way of reasoning and it is unreliable. Faith isn’t a way of reasoning. Faith is trusting in that which you have good reason to believe is true. Dr. Boghossian: The New Atheists paved the way. They started the movement. This book picks up and gives people specific tools. It is a road map. It is a tool book. It is a guide. It is a manual to help move the conversation forward and actually do something. It is a call to humanists and atheists and skeptics and philosophers. It is a specific road map that they can use to make a difference everyday. Anyone and everyone. People who have religious relatives, people who have religious friends, or faithful friends. People who engage with others of faith at any time. I would like to create at least ten thousand people – a minimum of ten thousand people. I look at faith as a virus. We give many inoculations to people – five, ten, fifteen people – on a daily basis. No matter whether it is a woman at the bank who wears a cross every time I see her, I go out of my way to wait in her line and then I immediately begin the intervention. Everyone, I’m looking for ten thousand people to start off with. Ten thousand people armed with these tools that can go into the streets and into the PTA, everywhere the faithful reside, into their own homes, and families and talk people out of their faith, out of their superstitions, and into reason and rationality. I think ten thousand people is a very achievable number. Kevin Harris: It is evangelism 101. Dr. Craig: It really is. Ten to fifteen people a day he wants you to talk to. Dr. Boghossian: We are trying to move people to the adult table where they can have mature conversations about how they know things and what their reason and evidence is for those things. Dr. Craig: [laughter] Yeah, well, I suppose that would be a pretty unreliable way of knowing something, wouldn’t it? If that’s your definition. Who would even need to write a book criticizing that if that is what faith is! This is so enormously condescending – talking about the kids’ table and the adult table, as though theists haven’t been presidents of the American Philosophical Association and some of the most brilliant philosophers and epistemologists of our day. People who understand all of the tools of critical thinking, logic, and analysis. Who is he kidding? Kevin Harris: There is a battle here – isn’t there? - for hearts and minds. There are going to be people who have a faulty view of faith who may be overturned by this methodology because he shows in his book how to dismantle that, by making you doubt. Dr. Craig: Yeah, absolutely Kevin. I’m sure that this could be very destructive in the lives of many people who don’t have a mature understanding of why they believe as they do. Anyone who thinks that we are not involved in a culture war just needs to listen to a man like this recruiting ten thousand people to go out and daily talk to ten to fifteen people everyday to disabuse them of their faith in God. Interviewer: You say you want ten thousand people to basically start going out and confronting people about their faith. What is to stop them from forming associations, groups, organizing? Dr. Boghossian: I hope they do, it would be great. An organization – that’s a fantastic idea. I write about that in the afterword of my book. Form organizations so that you can exchange – maybe YouTube is kind of like that. We can kind of say, this is what worked for my intervention. Maybe we should try this. Maybe they can go to churches together and wait until the church gets out. Kevin Harris: He said ideas – and I agree with him on this – are not immune from critique. Dr. Craig: Yeah, though, Kevin, you know something occurs to me with respect to this that is very interesting. When a person attacks theism, you are not attacking the individual. You are attacking the view. You are saying the view is false. Similarly, if we talk about atheism, we would attack the view that God does not exist and criticize that. But we wouldn’t attack the atheist himself. But what Boghossian believes and is involved in does seem to be very personal because he is attacking having faith. So this is a very personal attack in the sense it is saying “You are irrational.” He is definitely launching a personal attack upon people who have faith in God by saying that you are not a critical thinker, you are irrational, and therefore in some way you are substandard epistemologically. That is a lot different than criticizing theism as a view. He really is involved in a very personal sort of criticism I think. Dr. Craig: Yeah, he’s saying people are deluded. Dr. Craig: We want to affirm the importance of critical thinking and sound epistemology. But there is no reason to believe that sound critical thinking leads to unbelief, atheism, or agnosticism. See the previous Reasonable Faith podcast from April 6, 2014 where Kevin and Dr. Craig discuss this very phenomenon - “The Definition That Will Not Die!” - at http://www.reasonablefaith.org/the-definition-that-will-not-die (accessed April 14, 2014). This is quoting from an old revision of the Wikipedia article titled “Faith”, dated 01:03, 17 March 2014. See http://en.wikipedia.org/w/index.php?title=Faith&oldid=599943421 (accessed April 14, 2014).